"I would teach the children music, physics and philosophy, but the most important is music, for in the patterns of the arts are the key to all learning." Caryn Lin plays her 4-, 5-, and 6-string electric violins and uses sound effects and looping to create short, on-the-spot recordings of her violin, voice, percussion instruments, and other sounds. Layers of sound over deceptively simple melodies result in music that is both otherworldly and totally catchy, mesmerizing and completely unique. It is eclectic, combining New Age, world, classical, and rock seamlessly in a virtual orchestra. 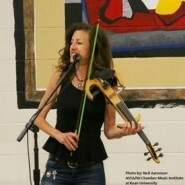 Caryn began violin lessons at age 9, and studied under the Philadelphia Orchestra’s Larry Grika until college, where she earned a violin performance degree from Northwestern University. Upon graduation, she moved to Germany to study with world-renowned violinist Suzanne Lautenbacher. 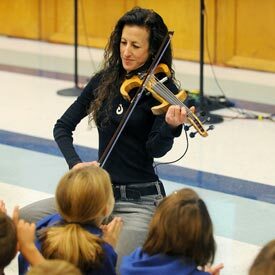 Caryn has performed everywhere from the Kimmel Center and Lincoln Center to the Crayola Crayon Factory and a Carthusian Monastery in the French Alps. Her music has been featured on MTV’s The Real World, on more than 150 radio stations in the US, UK, Spain, and Venezuela, and on satellite radio. She and her music appeared in the movie Philadelphia. Her fifth studio album, “The Cal,l” was released in 2006. A sixth CD is currently in the works. Since 2001 Caryn has worked with half a million kids in over 2,500 schools and community venues. It was the best assembly I've ever attended during my 20+ years as an educator. Unlike the music defined by pure genre, Lin's only limits are those of her electric violin.